Opel is set to launch its Ampera extended-range electric vehicle in Germany next month, but the auto maker’s top sales executive says the Chevrolet Volt-based car already appears to be an early success. Initial projections called for sales of 8,000 Amperas in the first year, but the auto maker now is eying 10,000-15,000 units. “We’ve got over 6,000 reservations, which is way above what we anticipated,” Visser says of the process in which a buyer can reserve an Ampera via the Internet with a E150 ($208) deposit. General Motors, which has encountered some hiccups in ramping up production of the Volt at its Hamtramck, MI, assembly plant, is expected to be able to meet forecast demand for the Ampera. Ampera is an important part of Opel’s efforts to move upmarket, the executive says. “I think it is a really big step here in Europe, because there are a lot of manufacturers talking about e-mobility…but we (are) the only one with an electric vehicle with no range limitation that is actually on sale today and not a concept car,” he says. Further moves into electrification also are possible. In September, Opel unveiled the RAK-e concept at the Frankfurt auto show. The EV resembles a 4-wheeled scooter, with seats for the driver and single passenger positioned in tandem. It has a 62-mile (100-km) range, a top speed of 72 mph (120 km/h) and can be fully recharged on household current in three hours. “Reaction to that vehicle was overwhelming and extremely positive,” Visser says, adding whether the car will make it to production remains unclear. The Opel Ampera is an electric car truly innovative. This car has two electric motors (one always working and another that is activated only when is needed) and one gasoline motor that recharge the batteries. It is therefore a hybrid car, which provides a considerable autonomy. 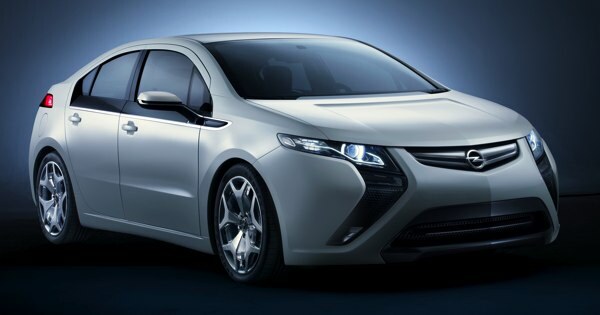 The Opel Ampera has four seats and is about four feet long. The interiors are well-refined and has two 7 inch screens, one showing the informations regarding the autonomy, the speed and the fuel consumption, while the other controls the functions of the navigation system. Despite being a comfortable car the purchase price is a bit too high (about 45,000 dollars).